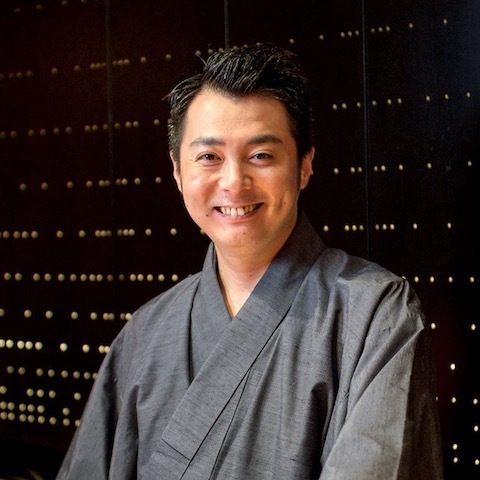 In this edition, we welcome Mr. Toshiyuki Kamiki, bartender at Bar yu-nagi. Kamiki-san exerts himeslf to “support agriculture through fresh cocktails,” building on his experience working for Japan Agricultural Cooperatives (JA). His passion has guided him to stand behind the counter in a kimono, communicating not only domestically grown product but also Japanese culture from Ginza to the world. We went for a stroll in Ginza to complete the mission proposed by Kamiki-san, “favorite destinations that have recently reopened after renovation . Our first destination was “Gunma-chan-chi,” where Kamiki-san often shops for ingredients to use at his bar. Gunma-chan-chi moved from its original location to reopen in Ginza 7-chome in June 2018. Its new address is close to GINZA SIX and customers can enjoy the taste of Gunma in a more spacious area offering a variety of beverages and sweets. Running a bar in Ginza, Kamika-san has come to the store to buy fruit and “amanatto” sugared beans to serve at his bar in Ginza from before the its relocation. On this visit, he purchased some “yayoihime” produced in Showa Village and recommended by the store staff. The renovated store has a section introducing selected sweets from Patisserie Potager, including cakes using fruit produced in Gunma Prefecture and healthy sweets using seasonal vegetables, that are attractive to both customers with a sweet tooth and those on a diet. In addition to food, high-quality silk products from Tomioka City are very popular. The soft texture and beautiful shiny gradation is extremely popular among fashionable women. They carry not only stoles but also pocket squares and ties that can be enjoyed by men. They make wonderful gifts. On the second floor, “Ginza Tsuru” serves dishes using Joshu Wagyu beef and vegetables produced in Gunma Prefecture. With 44 seats and a private room, the restaurant offers a rich Ginza dining experience. The barrier-free dining space with an elevator and multipurpose toilet can accommodate diverse needs. Please come to explore the new and enhanced offerings of Gunma-chan-chi. Our next stop was the fragrance store, ESTABAN GINZA, where Kamiki-san has always purchased fragrances both for his bar and for personal use. It has just reopened after renovation in January 30, 2019. The store was gently wrapped in an elegant fragrance that welcomed us at the entrance. ESTEBAN GINZA offers fragrances in various forms, such as room fragrance products and candles, ceramic gifts and fragrance cards. Kamiki-san’s bar is decorated with “Neroli,” a white and luminous floral perfume with a scent of jasmine and geranium. ESTEBAN GINZA recommends fragrance cards, which are their most popular products. Kamiki-san also uses fragrance cards from the Neroli series, the same fragrance that he uses at his bar. The scent can be enjoyed in various ways – by placing a card in your business card case or wallet, or by enclosing one in a letter. Allow me to invite you to experience new type of warm communication through fragrances that help leave a special impression upon people you meet or to whom you send a letter or gift. Furthermore, the newly opened L’Atelier des Parfums offers counselling in selecting fragrances. The store also has a gift corner where customers can choose the perfect gift. Please come to indulge in ESTEBAN’s gentle fragrances. Our final stop was “Koju,” a Japanese incense store that relocated from Ginza Core on January 30, 2019. Standing in the door, one can breathe in a 440-year history of Japanese fragrances. Since the store is in the same building as ESTEBAN GINZA, customers can enjoy both French and Japanese fragrances. The store displays various scented products, including incenses and incense sticks, incense pouches and eau de toilettes. With the recent re-opening, the store also carried incenses and other commemorative products only available at the Ginza store. Those who are not familiar with Japanese incenses can casually experience using incenses through three programs: “kikiko” “kodo” and “choko.” Each program is designed by season, therefore letting participants enjoy seasonal experiences. I was granted the opportunity to take an introductory lesson of the Kodo program. As I warmed a small piece of fragrant wood using the incense burner, its fragrance gradually spread throughout the room. Ginza offers unique opportunities to casually explore traditional “kodo” (incense burning). On the third floor of the building, the store gives authentic lessons in a tea room that is a replica of the tea room at Ginkaku-ji Temple, downsized by 70%. It was a luxurious and solemn place that made me forget that I was in Ginza. Koju offers the opportunity to experience the excellence of Japanese culture and aesthetics in an environment wrapped in fragrances representing the 440-year history that Koju Ginza takes pride in.